I often struggle to get vegetables (other than crudités platters) on my fall and winter party menus. Many winter vegetables just don’t lend themselves to quick and easy preparations because most benefit from a look roast or simmer. I’m also leery of putting out dishes that scream spring or summer, like a cucumber cup or a tomato skewer because they just seem so completely out of place during the cooler months. 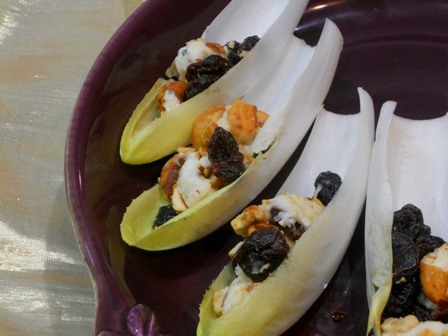 Over the years, I’ve found that stuffing endive leaves with a somewhat rich filling – such as the blue cheese, cashew, and dried cherry one featured in this recipe – is a happy medium. The endive brings some additional vegetable crunch to the table but the heartier filling helps it fit in with the rest of the dishes on the table. This endive recipe also comes together very quickly and requires absolutely no cooking, so it is a great last-minute dish to prepare for an evening get together after work. As you’ll see in the Recipe for Success section, the variations on this recipe are many. Choose your favorite combination of nut, soft cheese, and dried fruit and re-visit this recipe often with a new twist each time. Wash the endive, cut off the root end, and separate out the leaves. Discard the smallest and any torn leaves. Every head of endive is different, but you should be able to get 8 good size leaves from each one. Mix the cashews, blue cheese, and dried cherries in a medium bowl until well combined. Arrange the endive on a serving platter. Stuff each leaf with about 1 ½ Tbsp. of the filling. I found spicy cashews in the bulk section of my local market and I really like the extra flavor and oomph they added to the dish. If you can’t find spicy cashews, plain ones will do. You can use any combination of semi-soft or soft cheese, nuts, and dried fruit that you’d like in this dish. The sweetness of the cashews and cherries helps offset the tang of the blue cheese in this combination. If you used goat cheese instead of blue cheese, you might go with a slightly more tart dried cranberry and a less sweet almond or walnut. This is another one of those dishes that’s a great vehicle for the left over nuts and dried fruit typically used in holiday baking. You can make the endive several hours in advance. Cover them with plastic wrap and refrigerate them until you’re ready to serve. It’s okay if they sit at room temperature for a few minutes before guests arrive so the cheese can warm up just a tad.